Where trade winds carried legendary explorers like Marco Polo, Ibn Battuta and Fa-Hsien past Sri Lanka’s soaring southern cliffs on some of history’s most celebrated nautical journeys, Cape Weligama has become the most celebrated among Sri Lankan Beach Resorts, along this fabled island’s palm fringed shores. 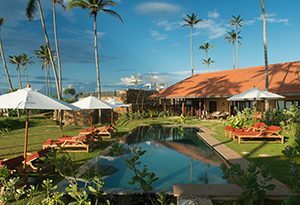 Thirty minutes east of Galle, Cape Weligama inhabits 12 manicured acres atop a singular promontory rising 40 metres above the Indian Ocean. Stunning panoramas await you, naturally complementing the 39 private retreats designed by one of Asia’s most celebrated architects, Lek Bunnag. The hotel offers an array of international dining venues captures Weligama’s iconic sunsets, as does the 60-metre crescent-shaped infinity pool that appears to flow seamlessly into the shimmering sea. Nestled into the natural slopes atop Weligama’s striking headland, a collection of private Suites and Villas; offering 39 bedrooms in all, create the welcoming illusion of a traditional Sri Lankan village. The Villas are set within eight stone ringed gardens. Each garden comprises two or three free-standing Villas plus a 15 metre infinity edge swimming pool. The Suites are situated around the Cove Pool in units of four. 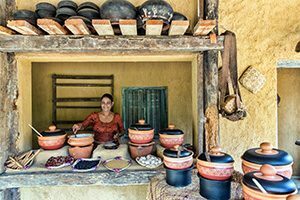 The resort features multiple restaurants that set the bar for fine dining in Sri Lanka. The resort’s handpicked wines complement these extensive East to West menus. Honouring the deep roots connecting Cape Weligama to this island’s rich history, the Cape Colony Club provides a relaxed yet refined venue for traditional Ceylon high tea, as well as to linger over sunset cocktails and after-dinner nightcaps under the stars. Enjoy the scintillating experience of famed Sri Lanka spa hotels, from the sanctity of your own suite or villa. For the ultimate Ceylonese indulgence, Cape Weligama’s experienced therapists come to your Suite or Villa where dedicated spa facilities allow us to pamper you. 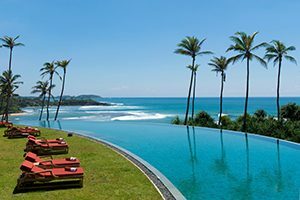 Cape Weligama boasts what is likely the best infinity pool in Sri Lanka! It’s equally resplendent at night when the pool’s inky surface reflects the stars and the bright luminescence of the moon. Hotel facilities also include a Cybex equipped air-conditioned gym for keeping in shape after overindulging on the resort’s mouth-watering cuisine. Electric buggies convey guests around the resort if they prefer not to walk.